In the last few days, there has been a lot of buzz about the YotaPhone, an upcoming Russian Android 4.2 smartphone featuring Snapdragon MSM8960 dual core processor with 2 GB RAM and 32/64 GB Flash. But the real innovation is the presence of 2 full 4.3″ displays: a standard LCD display on one side, and an E-Ink display on the other. Battery – 2100 mAh. The device supports wireless charging. You may think a smartphone with 2 displays will badly drain the battery, but the contrary may prove true. First, since the E-Ink display does not use power if the display content is not updated, it may not use very much power. Second, you may use the E-Ink display to do tasks such as checking the time, and receiving notification (missed call, SMS..) while the LCD display if turned off, which should prolong battery life. 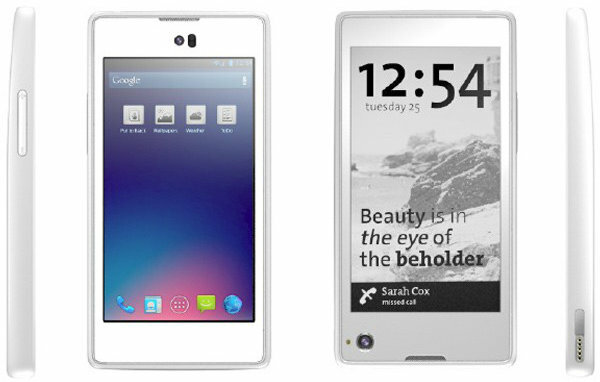 The YotaPhone will run Android 4.2 Jelly Bean, and should be available in Q3 2013 in Russia, and Q4 2013 in the rest of the world. EPD screen personalization app – You can select a wallpaper and other things to display on the EPD screen via an App running on the LCD. Run Google Apps on the LCD screen, and “transfer” the map to the E-Ink display, so that even if your battery runs out, the map will still be displayed, and you won’t get lost. If reading a book on a 4.3″ display is your thing, you can do so on the E-Ink display. Since the EPD does not have touch capability, you can scroll pages by swiping the zone at the bottom of the phone. You can configure the YotaPhone to send notifications to the EPD display instead of the LCD display. This looks quite nice, but I think it could have been useful to have a touchscreen with the EPD display, to make it more versatile, and allow you to make calls and/or write SMS directly from the EPD display for example. However, you would have to find some clever ways to disable touch on the display which is not in use. You may find more information on Yota Devices website.